This Slow-Cooker Take On A Childhood Favorite Is The Perfect Thing To Fill You Up! While we enjoy coming up with different dishes to make in order to avoid falling into a dinnertime rut, there are some nights when we come home after a long day and just can’t muster the energy to whip up a big meal. In those cases, we have an arsenal of filling, relatively easy recipes that deliver on flavor and don’t leave us feeling completely drained after whipping them up. Sloppy joes are a go-to for us, but the other night when we were contemplating what to serve, we wanted to see if there was a way we could get the same sloppy joe flavor we know and love, but turn it into a little something different…and we did! 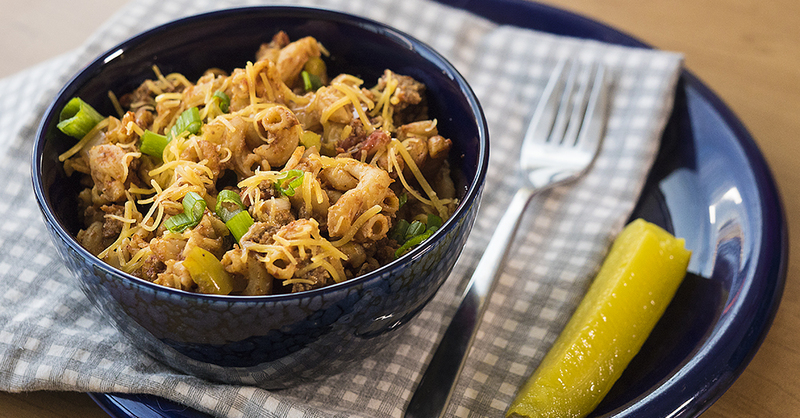 What is typically a deliciously messy sandwich was transformed into a hearty pasta bake that our family devoured – you’ll have to make it to see how good it is for yourself! Pour olive oil into bottom of slow cooker to coat, then add beef, noodles, sloppy joe sauce, diced tomatoes, onion, bell pepper, chicken stock, garlic, cayenne, chili powder, salt, and pepper. Stir well to combine, then cover and cook on high for 2-3 hours, or on low for 5-6. Remove lid, and stir in pickles and cheddar until evenly combined. Garnish with additional pickles and cheese, serve warm, and enjoy!